If you are in Asia and need to buy Red Palm Oil online,... – Juka's Organic Co. If you are in Asia and need to buy Red Palm Oil online, especially a good brand from Africa, ethically harvested, authentic and all natural then Juka’s Organic now makes it easy for you. 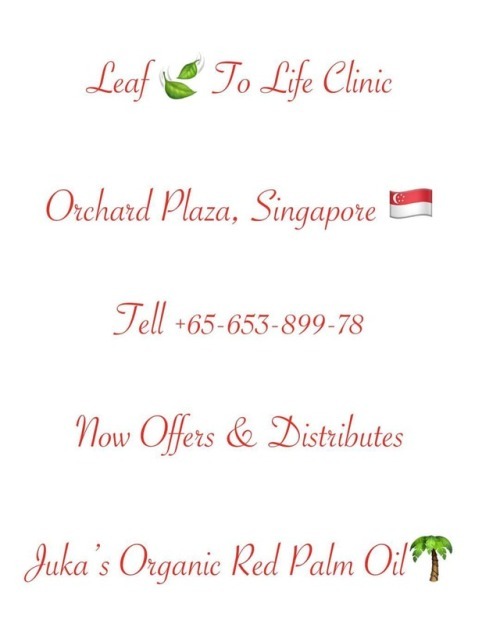 Visit Jukasorganic.com for the address or email us and we will connect you with our Distributors in Singapore. Leaf To Life at orchard plaza sells our red palm oil and have it available in stock now. You no longer have to pay for wry expensive shipping fees or wait weeks to get your red palm oil from us. You can now order from them over the phone at the number above and have it shipped to you or pick it up if you are in Singapore and close orchard plaza. Authentic red palm oil has been used for centuries by ancient Africa, as a healing cooking oil. But over the years the trees have been replanted around the world, to mass produce the oil “palm oil” from the kernel to use in cosmetics & lot of essentials foods. This has caused a lot of controversy for rainforest distraction but also endangering wildlife. Little do they know, in Africa, particularly the villages, where red palm oil is indigenous to, the tress still stand tall and the villagers harvest the red palm oil from the fruit (which is different from the oil from the kernel) every 3-4 months as Mother Nature intended it to be done. All natural palm fruit oil is healthy for the human body for many reasons. Red palm oil has been know to help lower cholesterol and also offers carotenoid to the body which turns into vitamins A when the body breaks it down. It is also know to have high levels of antioxidant which is anti inflammatory and kills free radicals in the body. The health benefits that are in red palm oil have been underrated in the Western parts of the world but slowly but surely, the world is getting round. So before saying no to red palm oil, give a chance to red palm oil from Africa especially type that is authentic and ethnically harvested. For more on this oil, visit us at www.jukasorganic.com & check out the store locator for our partner stores.